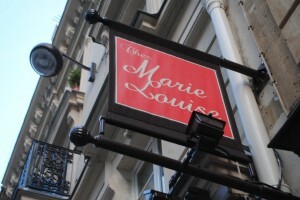 Chez Marie Louise is an oasis of fantastic and authentic Parisian food. I’ve been back from France for three weeks and since I probably won’t be visiting again soon, I find myself REMINISCING by looking at the photos I took. Of all the cities I visited, my favorite was Paris, which happened to be our last stop. 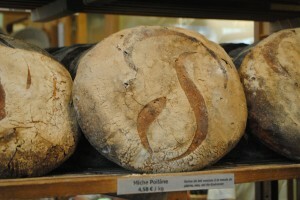 I had been to Paris 2 years ago and was less than satisfied with the food and the people. I was on the receiving end of one too many of those INFAMOUS “French stares.” So, with bad memories and a very unimpressed stomach, I VOWED never to set foot on Parisian soil again. Never going back to Paris would be too soon for my taste. Look at how well that went for me: Our flight from France back to America took off from Paris and I had to make the best of a short day in the City of Lights. After a whirlwind David Lebovitz tour of Paris, we had dinner at Chez Marie Louise, a Trip Advisor recommendation. 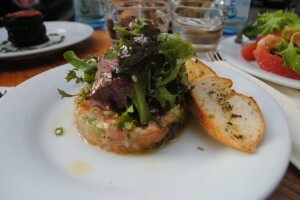 The restaurant was reasonably priced, and the food was exquisite. We ate outside and the ambiance was enhanced by the buck naked neighbor watching the diners from his terrace across the street. Delightful. Cancel that previous vow I made. I can’t wait to get back to Paris. 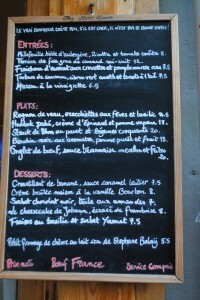 The menu at Chez Marie Louise consists of traditional Parisian fare. 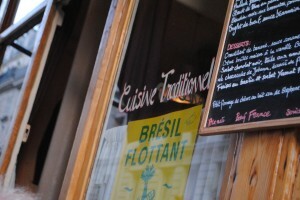 “Cuisine Traditionelle” is hard to come by in Paris. Seek and you shall find. I’m a sucker for all fish tartares, and the one served at Chez Marie Louise is prepared simply with a squeeze of lime juice, toasted baguette and fresh lettuce. 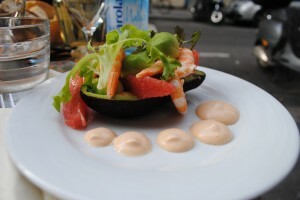 This dish consists of a halved avocado, shrimp and grapefruit segments and is served with arugula and a creamy sauce, a surprisingly delicious combination. 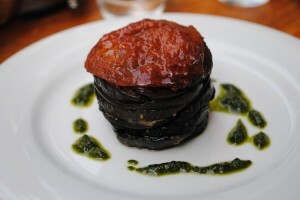 My mom ordered this tower of roasted eggplant which is served with a house-made sun-dried tomato sauce, ricotta cheese and a pesto sauce that has a slightly smoky flavor. I also love steak, so it was a no brainer for me when I saw a steak dish on the menu. 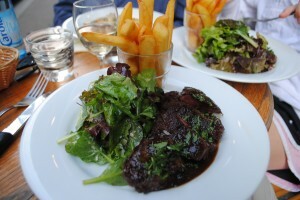 This steak sits in a thickened red wine sauce and is served with “pommes frites.” Oh La La. My dad picked this fish dish which proved to be the best thing on the menu hands down. 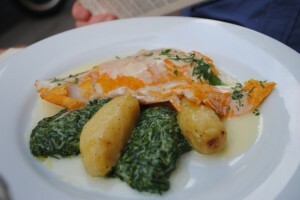 It consisted of fish served in a creamy sauce with creamed spinach (I swear this was so incredibly tasty. It was anything but your grandma’s bland creamed spinach) and potatoes. 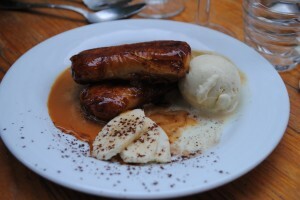 The waiter convinced us to try the banana, caramel and ice cream dessert which was an out of this world, amazing, tasty, crispy, smooth, sweet and satisfying treat. 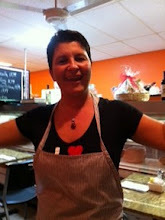 The charming and enthusiastic owner of Chez Marie Louise made the dining experience special and hilarious. I’m finally home from my vacation in France, Amsterdam and Berlin, and as with any trip I’ve ever taken, I am experiencing some mixed emotions about being back. I try to lessen these FLUCTUATING feelings by living by my mom’s MAXIM, “It’s great to travel and it’s great to come home.” I was able to finish off the trip with a short, but oh-so-sweet stop in the city of lights. 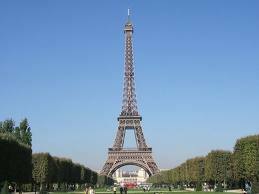 I spent one week in Paris two years ago and wasn’t as impressed as I had anticipated. During that entire trip, I RELENTLESSLY tried to convince myself that I was as obsessed with the city as most Americans are. I am proud to say that thanks to my most current trip, I am a CONFIRMED Parisian-Lover, and the half-a-day I spent in Paris was, finally, as lovely as I had hoped. I have one tip for ASPIRING travelers: Before you depart, read a book/s about the places that you are going to visit. During this trip, I read The Sweet Life in Paris, by food-blogger, David Lebovitz. At the back of this fantastic book, Lebovitz recommends restaurants, boulangeries, fromageries, e.t.c in Paris. Coming from someone who has lived there for over a decade, I trust his advice and made a point to stop at some of his holy grail Parisian places. 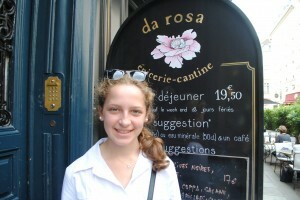 Restaurant Da Rosa offers traditional and authentic French fare. David Lebovitz recommends these “deceptively simple” and incredibly delicious apple tarts from Poilâne. 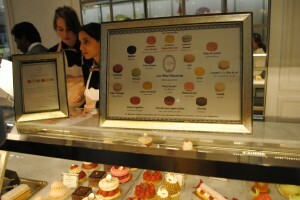 The rose infused macaron I had from Ladurée was the single best dessert I have tasted. They definitely live up to their reputation. 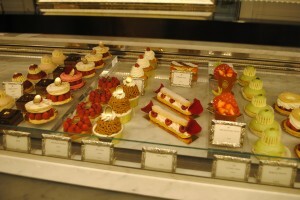 The pastries at Ladurée looked just as divine as the macarons. 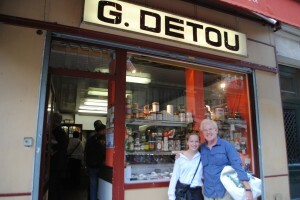 G. Detou, which translates to “I have everything,” offers specialty foods ranging from chocolate to mustard. David Lebovitz says, “If G. Detou didn’t exist, I couldn’t live in Paris.” Please Note the E. Dehillerin bag in my Dad’s hand. Ripe, a PAEAN to produce, is the product of a collaboration between an omnivore food writer and a pescaterian photographer. I had to spend a good amount of time with this book to figure out exactly how to characterize it. It’s a cookbook, but not really. It’s a photo essay, but not really. It’s a handbook of fun food facts and healthy eating ideas, but not really. Actually, it’s all of the above. It finally hit me that the book doesn’t neatly fit into any once category. It’s really a love poem celebrating the wonders of fruits and vegetables. The book has an unintended, extra added bonus for SATgourmet followers: some seriously good vocabulary. 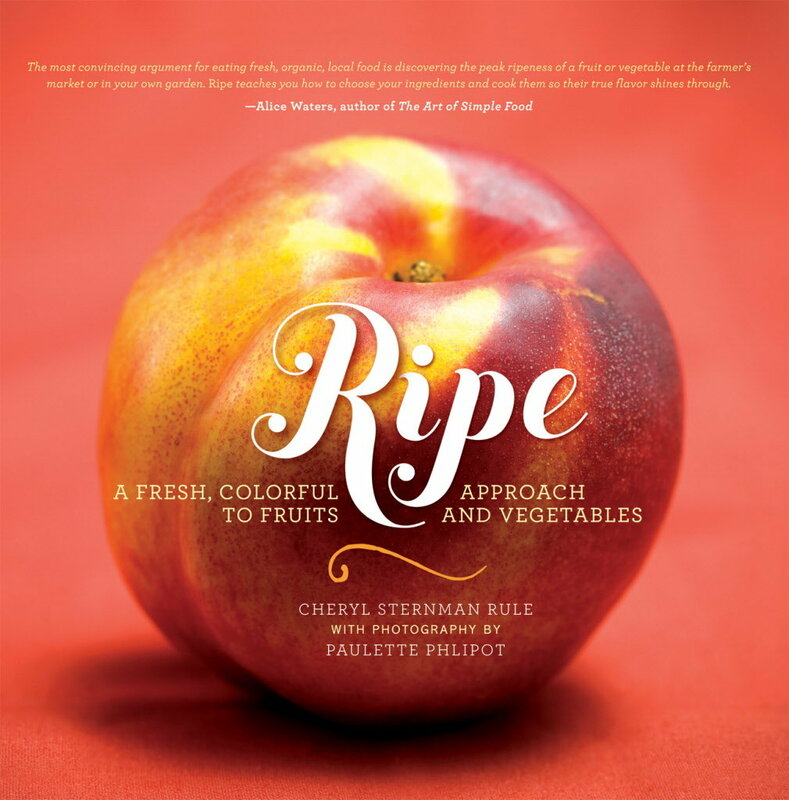 In her introduction to the book, author Cheryl Sternman Rule declares that being a food marm is not her intention: most likely you already know the importance of healthy eating. Her mission is to help you find the joy and beauty of produce, experience flavorful dishes, and spark your imagination to create some recipes of your own. Rainbow of food colors in "Ripe" AKA "Roy G. Biv" AKA the electromagnetic spectrum. The book is organized by color rather than season, which is unusual for a produce-focused cookbook. Sternman Rule features 76 fruits and vegetables in rainbow order: red, orange, yellow, green, purple/blue and white (which physics students such as me will recognize as “Roy G. Biv”). Each one is introduced with chatty insights and observations by the author, followed by a recipe and a “simple uses” suggestion. Most of the recipes are easy to prepare and range from fairly standard (Grilled Asparagus With Chopped Egg and Champagne Vinaigrette, Ginger Cashew Cauliflower, Peanut Strewn Purple Cabbage Slaw), to unique and different (Jicama with Peanut Sriracha Dip, Cremini Farro Hash with Poached Eggs, Persimmon Apple Radicchio Stacks). 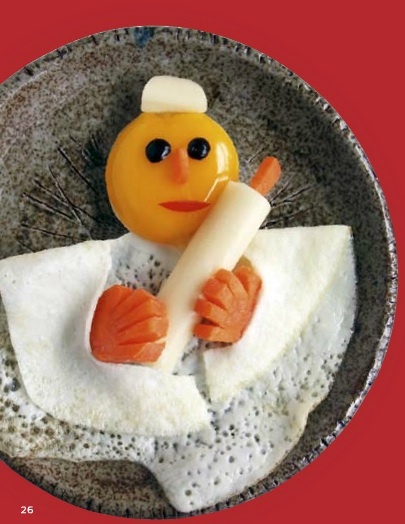 Photographer Paulette Phlipot’s painstakingly perfect images show REVERENCE for food. 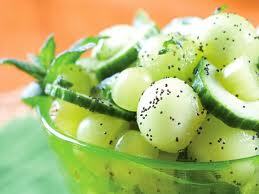 Have a look and I promise, the pictures will make your mouth water. The most unique and possibly most useful aspect of the book is the “Simple Uses” suggestion that follows each recipe. The list of 3 practical uses and/or flavor ingredient combinations is meant to prod the inner chef out of your culinary comfort zone and help you get creative. If food is your muse, this is your book. “Ripe” is available nationwide in bookstores and through online booksellers. Thanks to Cheryl Sternman Rule for the LITANY of SAT vocabulary in her book. Available on Amazon, online booksellers and in local bookstores. 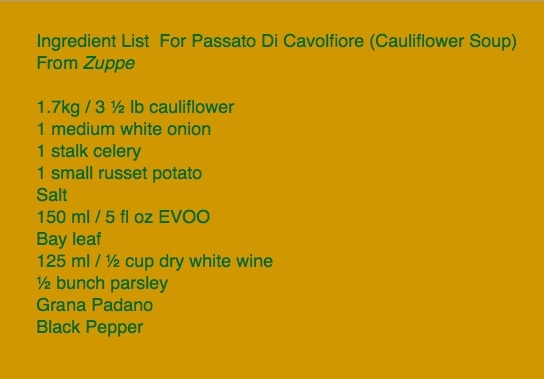 The recently published Zuppe features 50 soup recipes prepared by members of the Rome Sustainable Food Project, a mess hall serving the community of artists at the American Academy in Rome. As a diehard Italophile, I was predisposed to love this book, and I wasn’t disappointed. Author Mona Talbott, a Chez Panisse and Alice Waters disciple, is a frugal foodie who proves (with grace and style) that healthy, tasty, economical meals can be prepared on a shoestring budget. She crowd sources the recipes from her staff and local food PURVEYORS, and demonstrates that institutional dining doesn’t have to be institutional. 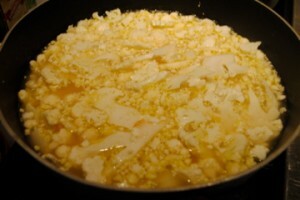 You can substitute Parmigiano Reggiano for the Grana Padano. Starting with the fall, and following the academic year, the book is divided by season, insuring that the freshest produce forms the daily cuisine. 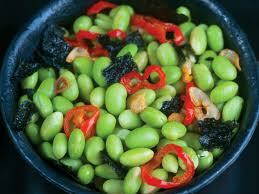 The soups are HALE and hearty, using very basic ingredients that are readily available. 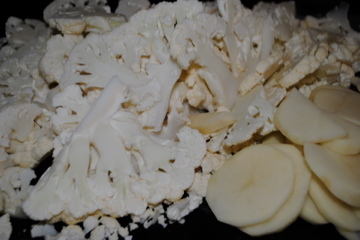 The recipes are designed to serve either 4 – 6 or 6 – 8 and are offered in both American and European weight systems (ounces and liters, pounds and kilos). The recipes appear to be relatively simple, so I asked my Mom, who is severely cooking-challenged, to try two of the recipes. Even though we are ENSCONCED in spring, I chose two of the winter recipes, which seemed appropriate because it’s still cold in New England. My Mom prepared the “cauliflower soup” and the “lentil and carrot soup” during my long weekend home from school. She was stressed by less than exact directions, such as “a bunch of parsley.” How big is a bunch??? 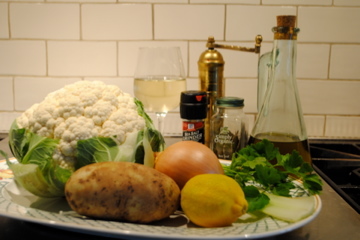 Chop the cauliflower and potato. 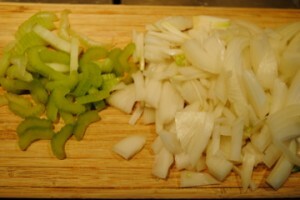 Chop the celery and onion. 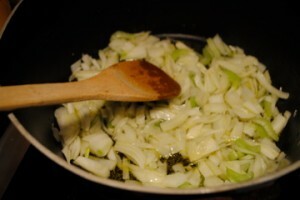 Saute the celery and onion. Mom asked me to help with the seasoning. 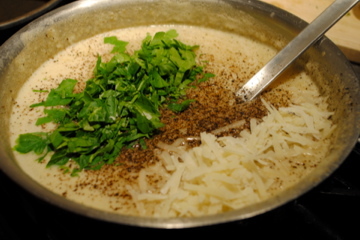 Add parsley, cheese and black pepper just before serving the cauliflower soup. We served the soups with artisanal bread and salad. 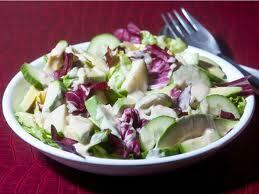 The meal didn’t disappoint but Mom complained that the recipes were DECEPTIVELY simple. 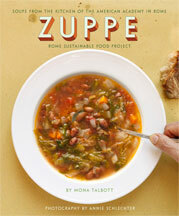 The proceeds from sales of Zuppe support the Rome Sustainable Food Project, a very worthy cause. I love that the cover is faux-distressed to suggest that the book is a hand me down from Grandma. Soup is a staple meal for year round cooking, which makes Zuppe an INDISPENSABLE addition to your cookbook collection. Reading and studying "Words That Make A Difference" is a great way to learn more vocab! On my hunt to find another creative vocabulary book, I came across Words That Make a Difference: and how to use them in a masterly way, written by Robert Greenman. Words That Make A Difference offers yet another way to ATTAIN a great vocabulary through context. The book features hundreds of words that were used in passages from the RENOWNED newspaper, The New York Times. 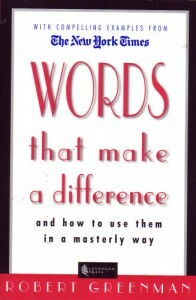 The book also includes a vocab list at the beginning and offers an easy tool at the end to clear up common linguistic mistakes, such as understanding the difference between “affect” and “effect.” There are about 400 pages of vocab words used in context, a sentence definition of that word and also how to sound it out. This book will keep you busy! Words That Make A Difference is a self-guide to learning words by reading passages that were written by vocabulary experts. It’s interesting and it makes learning fun. Words That Make A Difference was published in 2000, so it can be considered a “classic.” For words that make a difference today, Erin McKean writes a column for the New York Times NEMESIS called, Week In Words, a field guide to unusual words in this week’s Wall Street Journal. Erin highlights vocab that is not likely to appear on standardized tests but is fun NEVERTHELESS. 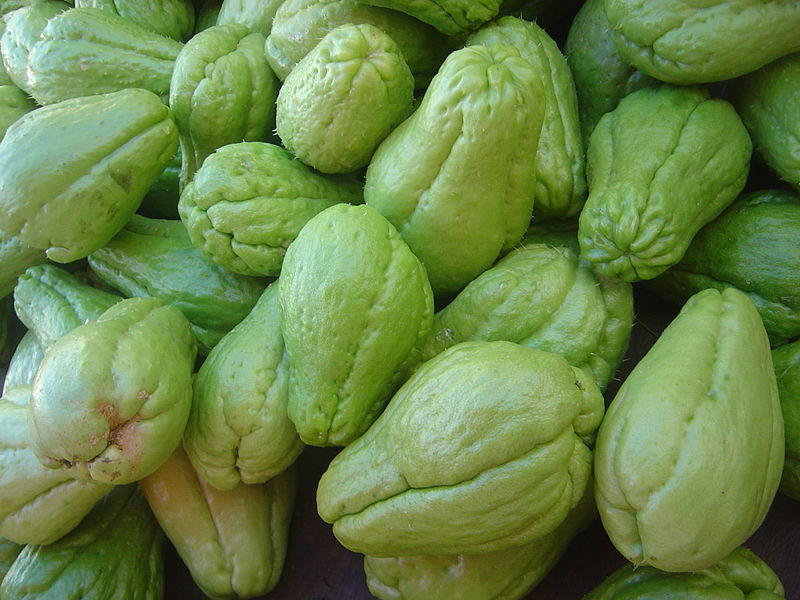 the mirliton squash (also known as a chayote) can be swapped for bitter melon varietals. April 25th is National Zucchini Bread Day… consider baking a mirliton bread to celebrate! Scarlott Paolicchi recently featured my Zucchini Brownies recipe and fun fact vocabulary from Cook Your Way Through The S.A.T. on her blog, www.FamilyFocusBlog.com. Brownies aren’t exactly bread…but close enough? "Funny Food" is laugh out loud funny. Parents can no longer ADMONISH their kids, “don’t play with your food,” thanks to the recently published, “Funny Food,” a book that makes fooling with food a high art form. For the last 50 years, Bill Wurtzel has entertained his wife Claire by feeding her edible art for breakfast. His kids and grandkids are lucky enough to also be in on the fun. The result of Bill’s labor of love is a beautiful book that showcases his OEUVRE, 365 photos of playful, creative dishes, one for each day of the year. The book also offers food tips, recipes, nutritional insights and a step-by-step guide showing how to make a few of his breakfast designs. Egghead bar mitzvah boy is my favorite of all of Bill Wurtzel's creations. “Funny Food” is an innovative tool for families interested in spending quality time preparing healthy breakfasts, discussing good nutrition and getting kids to use their imagination. The book features breakfasts that include eggs, pancakes and waffles, oatmeal, fruits and veggies, cereal, pita, yogurt, nuts, cheese and jam, enough of a variety that even the most finicky eater can be satisfied. Mealtime really can be joyful. Bill and Claire have been conducting funny food workshops for kids in New York City schools for the last year. They are concerned about childhood obesity and hope to promote healthy eating by inspiring kids to make good food choices and empowering positive eating habits. They understand that making healthy food look good actually makes it more PALATABLE. Speaking from personal experience, school cafeterias could also learn a thing or two from this book! This guy definitely helps the veggies go down easy. “Funny Foods” is guaranteed to put a smile on your face. The book is informative, and as the title suggests, funny for kids of all ages (even the grownup ones). “Funny Food” is available on Amazon. 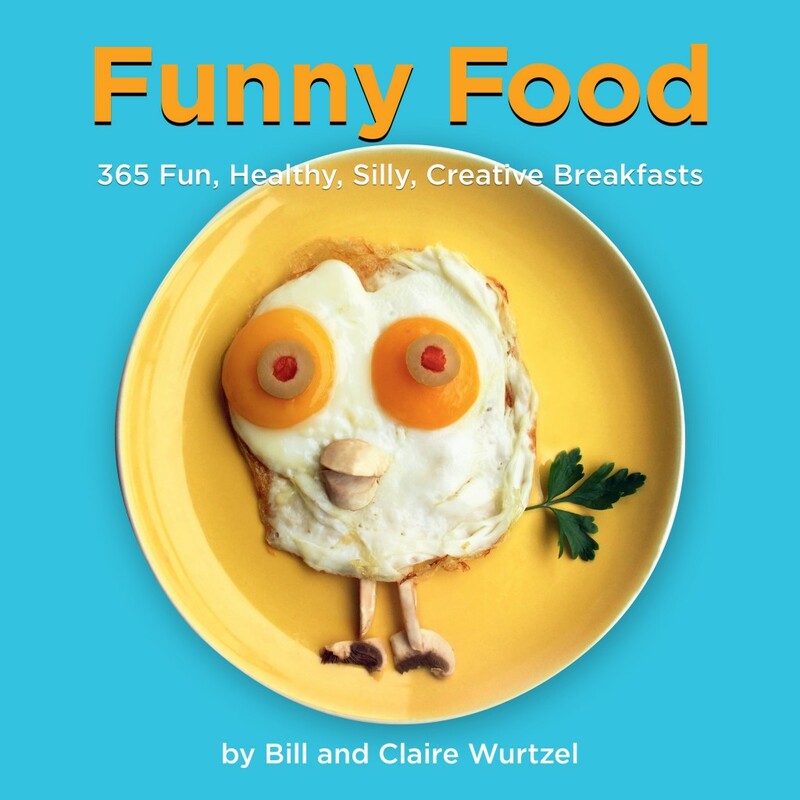 For more information about the book, Bill and Claire Wurtzel and their workshops, visit www.funnyfood.us. The last sentence of the book is, “”And of course, don’t forget to eat your veggies!” I hope this means Bill will follow up with a “Funny Veggies” book. 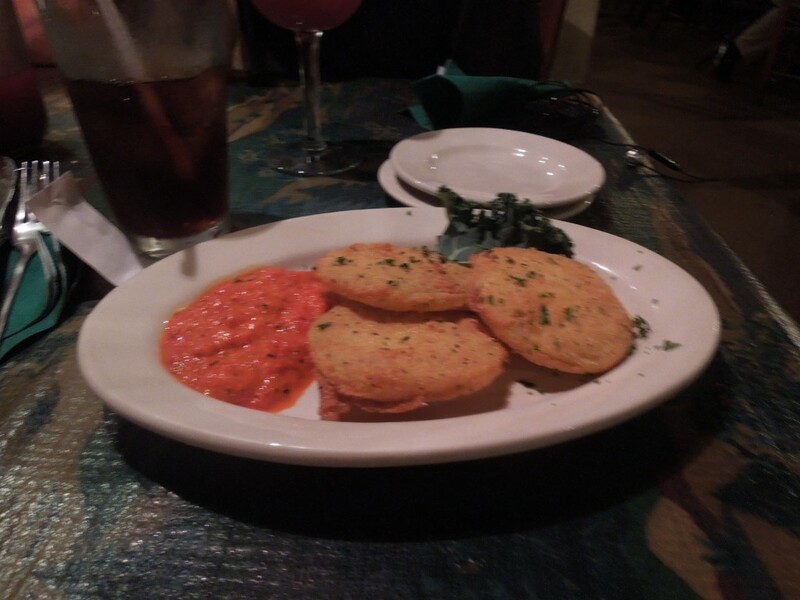 Fried green tomatoes are a great southern appetizer, and "Blackwater Grill" knows how to make them well! Following a six-day stay on Useppa Island in Florida, we’re heading back home. Tonight we ‘ve stopped in St. Simons, Georgia, a QUAINT and charming southern town. For dinner, we dined at the “Blackwater Grill,” a restaurant featured on an episode of “Diners, Drive-ins, and Dives.” The food proved to be MEDIOCRE, with the exception of their scrumptious fried green tomatoes. In addition to their perfect crisp, the sweet roasted red pepper sauce perfectly complemented the tomatoes and also added color to the almost PELLUCID fried tomatoes. 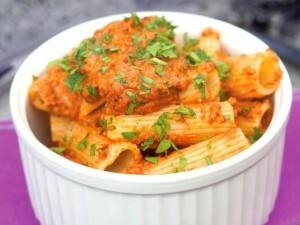 I have my own recipe for this dish in “Cook Your Way Through The S.A.T.,” but was thrilled to try a different version! An oasis of great food in Sarasota, Florida. My spring-break family road PEREGRINATION landed us in Sarasota, Florida. 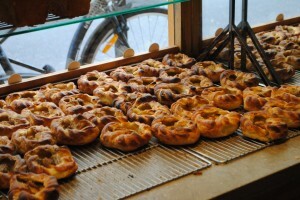 Contrary to popular opinion, fantastic food can be found in all cities…if you look hard enough. 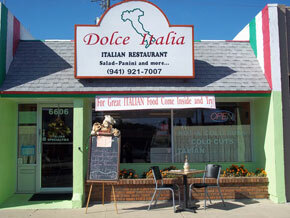 My Dad is a good-restaurant-magnet and he uncovered “Dolce Italia,” a family-owned Italian eatery. 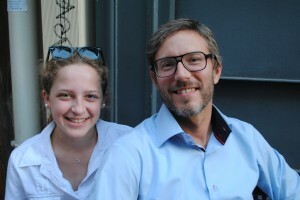 Tiziana and Pippo emigrated from Naples a few years ago and have been serving traditional Neapolitan dishes ever since. We sampled the antipasto, caprese salad, meat lasagna, spaghetti alla puttanesca, and a red fish that was served with a delicious tomato-based sauce and finished with a touch of cream. Tiziana is truly an Italian spirit. Seeing the restaurant from the outside proves that one should not judge a book by its cover. “Dolce Italia” is located in a DISMAL strip mall on a busy road, but once inside, the charming ambiance and delicious food transports you to Italy. 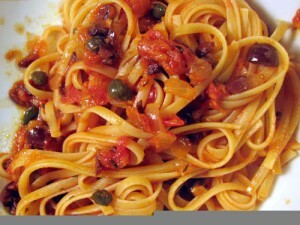 The highlight of the meal was the spaghetti alla puttanesca, (puttanesca is a tomato sauce with capers and olives) which was a more TANGY version of what is traditionally prepared in America. The pasta dishes were perfectly al-dente. The service was excellent and the waiter/waitresses got out the food in a timely manner. The portion sizes were a little small, but didn’t diminish the dining experience. Pasta puttanesca is a classic Neapolitan dish. 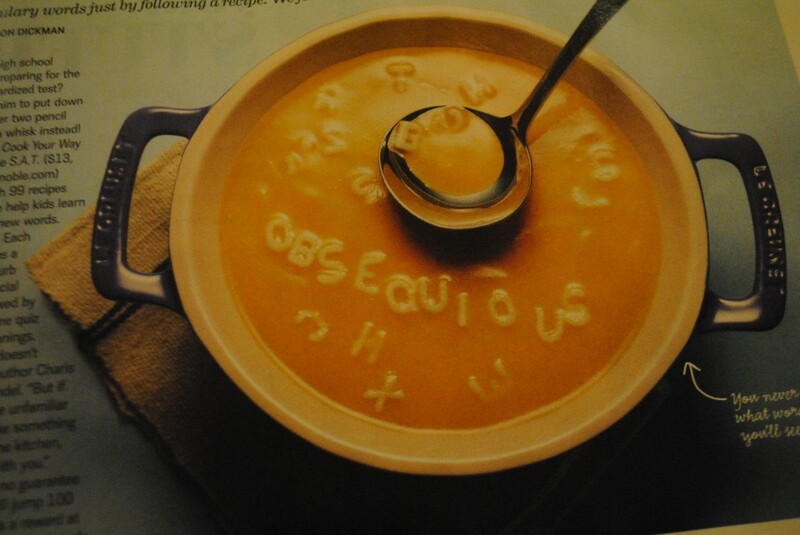 Alphabet soup not only tastes good, it's good for your S.A.T. 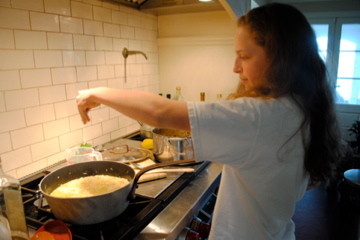 Thank you to Allyson Dickman, writer for Every Day With Rachel Ray magazine, for mentioning “Cook Your Way Through The S.A.T.” in the March, 2012 issue. I love their photograph, which shows that alphabet soup can be put to use when you’re studying standardized test vocabulary. I was just home for the weekend and looked through my collection of favorite books. 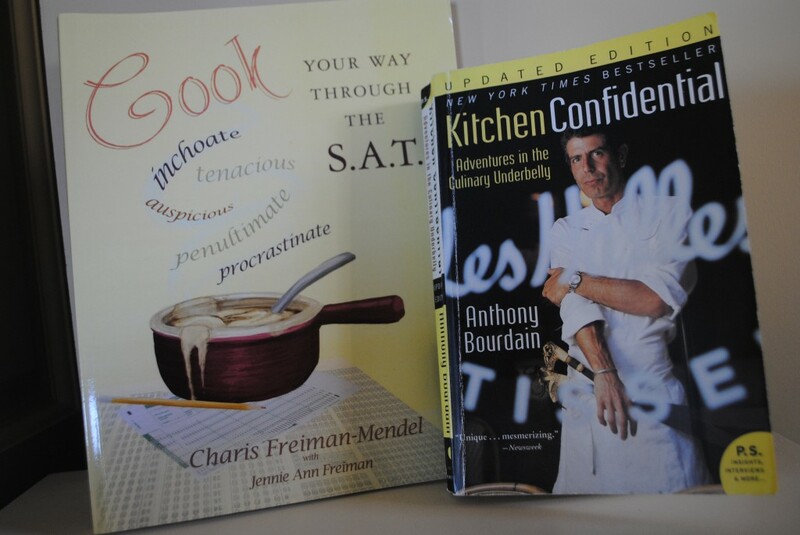 Kitchen Confidential by Anthony Bourdain was part of my “recreational reading” during my 7th grade homeschool. Bourdain, who worked every position in a restaurant, allows the reader to experience the culinary world through his SARDONIC outlook. He uses lots of raunchy language and doesn’t know the meaning of the word GINGERLY. Many of his stories are laugh-out-loud funny and many are informative. After reading the book, I now know what to eat when and what not to eat why. For example, it’s never an advisable strategy to eat frittatas for Sunday brunch because the chef fills them with leftovers from the previous week. 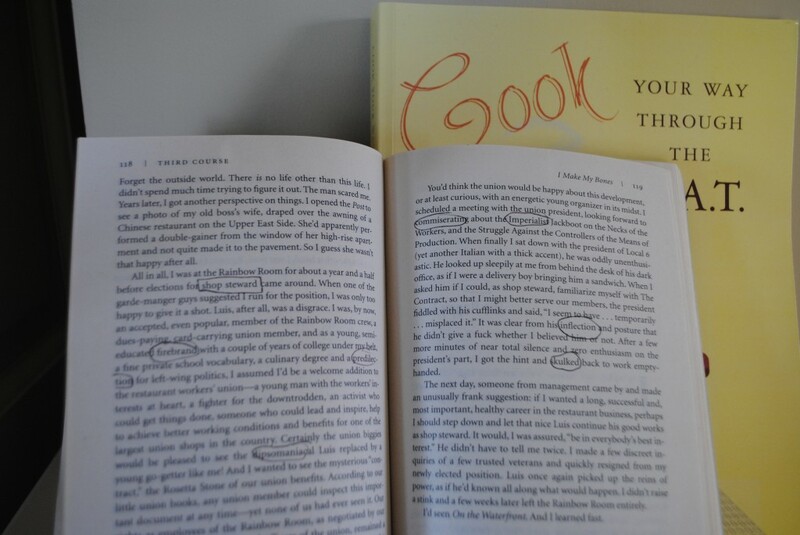 I marked up my copy of "Kitchen Confidential" using "read, circle, lookup"
Kitchen Confidential is a great read and has tons of standardized test vocabulary. That’s win – win for a foodie like me.